Cost effective Combination Electrode for general Applications. 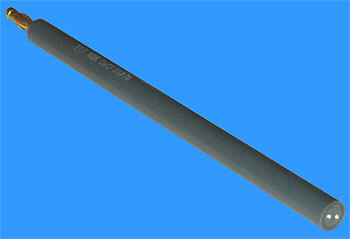 Combination Electrode for more demanding Applications. Combination Electrode for high Precision Applications. Single Junction Ag/AgCl Solution Reference with annular Ceramic liquid junction. Temperature Range 0°C to 80°C. Dimensions 12 x 120 mm. 1 m Cable and BNC Connector. 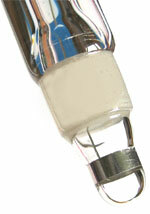 To prevent the electrode from drying-out it is stored in an O-Ring sealed bottle filled with Soaking solution. This is a safe and comfortable solution to store and remove the electrode. For more Information about the ELIT Ion-Selective Electrodes please click here. For more Information about Ion-Selective Measurements please click here. Temperature Range 20°C to 40°C. The ELIT solid-state 8 mm diameter Ion-selective Electrodes are high-quality ISEs which can be combined with a Reference electrode in an easy to handle "Electrode Combination" by means of an Electrode Head. The Ion-Selective Electrode can be stored dry and the Reference Electrode can be stored wet, which increases the storage and working life considerably. The Ion-Selective Electrode and the Reference Electrode can be replaced independently. 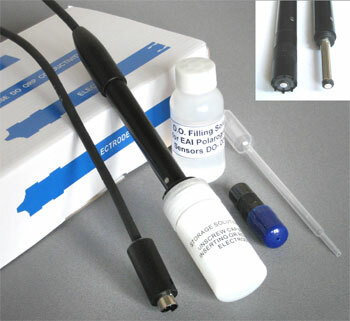 One Reference Electrode can be used with ISEs for various Ions. Available for the Ions as shown in the Table on the Left. Click on the requested Ion to open the Data Sheet. Reference Electrodes are necessary to complete / close the electrical circuit / loop when Indicator Electrodes like pH-, ORP-and Ion-selective Electrodes have no built-in reference system. Fig. 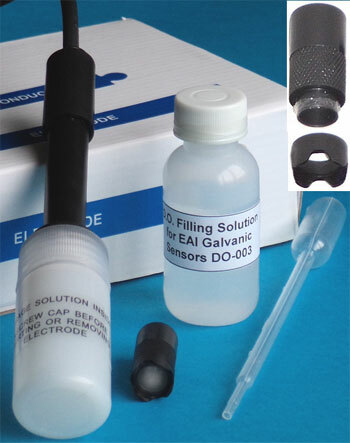 1 shows a Gel-filled Reference Electrode with Plastic Body (EAI-R02) and a Refillable Reference Electrode with Glass Body (EAI-R01). 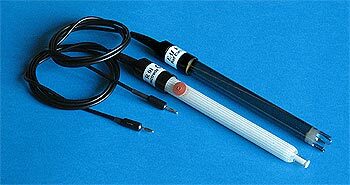 The Electrode with Plastic body is more robust and suitable for field-measurements. The Electrode with Glass body has a more stable signal output for high precision measurements and long-term measurements. Fig. 2 Shows the "Liquid Junction" in form of a Ceramic "Frit" of the Glass Electrode. Fig. 3 Shows the "Liquid Junction" in form of a Ceramic "Frit" of the Plastic Electrode. Fig. 4 Shows a Reference Electrode for the ELIT Ion-selective Electrode combination. The EAI Reference Electrodes have 1 m Cable with a 2 mm "Banana" Plug. The ELIT Reference Electrodes have a gold-plated 4 mm "Banana" Plug. Replacing the membrane is quick and easy. Simply unscrew the old assembly, fill with electrolyte (filling solution) and screw it on to the electrode. Output Range: 4 µA, ± 1.5 µA in air saturated De-Ioned water and ± <= 0.15 µA in Zero Oxygen At 25 °C. Fig. 5 shows a Glass conductivity Cell with Cell Constant K = 10 and a Plastic Conductivity Cell with built-in Temperature Sensor. Fig. 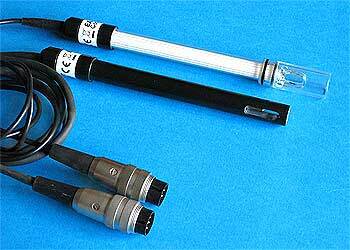 6 shows one Graphite Electrode and the Temperature Sensor of a Plastic Conductivity Cell. Fig. 7 shows the "Platinum Black" electrodes of a Glass conductivity Cell with Cell Constant K = 10. Siemens / Matsushita R-T curve-matched Thermistor B57863-S104-F9. 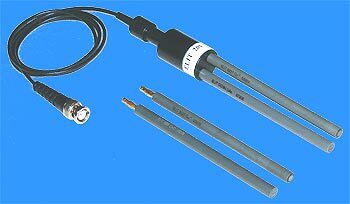 Pt 1000 temperature sensors can be used with all instruments suitable for Pt 1000. Stainless Steel 3mm shaft, NTC Thermistor Element. ETFE-coated 3.5mm shaft, NTC Thermistor Element.